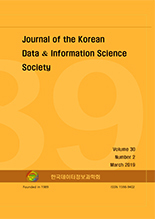 Joonsung Kang,(2019).Comparison of false discovery rate procedures in microarray studies.한국데이터정보과학회지,30(2),455-468. We consider the problem to identify differentially expressed genes in microarray studies, which involves a proper multiple testing to high dimensional and low sample size problems in nonstandard data setups. In particular, we need to account for unknown dependence structures among genes in microarray data. A traditional multiple testing rate, family-wise error rate (FWER) is too conservative to control the type I error in these setups, whereas a less conservative multiple testing rate, false discovery rate (FDR) has gotten much attention in a lot of research areas such as genomic data, FMRI data and so on. We compare various FDR procedures in simulated data and real microarray data. For simulated data with dependency, we take hidden Markov model (HMM) into account in order to generate test statistics. For power consideration, we assess different FDR procedures by utilizing false negative rate (FNR). By calculating 1-FNR for each FDR procedure, we consider which FDR procedure is appropriate for identifying differentially expressed genes in microarray data. Numerical results show that the Sun and Cai FDR procedure (2009) is more appropriate for controlling the FDR while minimizing FNR in simulated data under various setups. It also controls the FDR in real microarray data.